Q: Can we determine from the results of long-term scheduling what kind of products we should be selling? 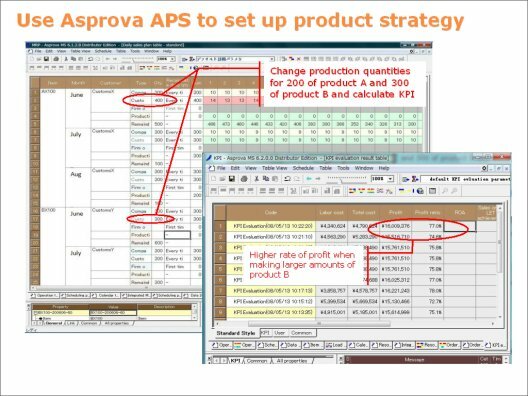 A: We can use long-term scheduling to simulate product strategies (product mix). In the diagram below we simulate as to whether we should produce product A or product B, how much we should produce, and how we should maximize profit. The simulation results in a conversion of product A to 200 units and product B to 300 units. The example in the diagram shows that it's better to shift over to making more of product B and doing so will give a higher rate of profit.